TradeOgre is a cryptocurrency trading platform that allows its users to trade many different cryptocurrencies against Bitcoin. According to CoinGecko, TradeOgre was launched in 2018, which makes it a relatively new cryptocurrency trading platform. Unfortunately, the company’s address of registration cannot currently be found online, not even in their Terms of Service. Neither could we find any info as to the people or the organization behind the website tradeogre.com. Forexbrokerz also mention that TradeOgre’s team doesn’t have a presentation and there is no info on the legal entity behind the exchange. Similarly, we could not find any info as to which market this platform is focused on, or if there are any country restrictions regarding registration. However, we managed to find information suggesting that US investors are allowed on this cryptocurrency trading platform. TradeOgre offers a very straightforward registration process, whereby users only enter a valid email address. Trading can be done immediately after one has set up their account and deposited bitcoin or other currency of choice to their exchange wallet. There currently is no info regarding any different verification levels offered by the exchange platform, or respective trade volumes tied to each level. if you are new to cryptocurrency trade, this is not the place to start learning. Unlike a lot of other exchanges, this trading platform does not accept any deposits of fiat currency. According to cryptowisser.com, TradeOgre trades in as much as 56 different cryptocurrencies. 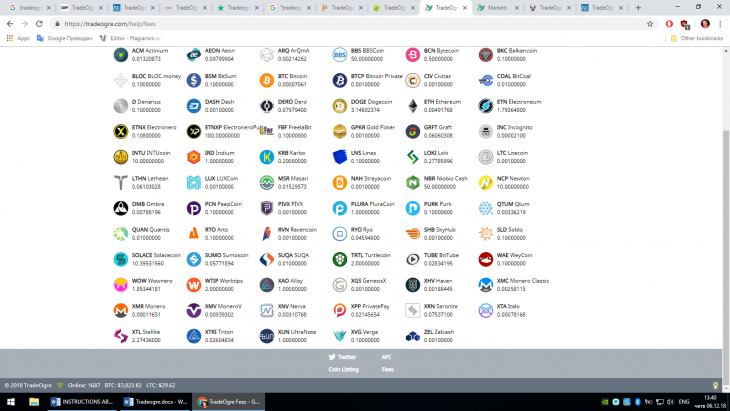 The more popular ones are as follows: Aeon, Alloy, BitCoal, Bytecoin, Civitas, Dash, Electroneum, FreelaBit, IntenseCoin, Karbo, Litecoin, Monero, PeepCoin, Stellite, Strayacoin, Sumokoin, Turtlecoin and Verge. Some of the coins at TradeOgre are little uknown. It is also worth mentioning that some of them were trading at 0.00000001 BTC at the beginning of of 2018. Be careful when trading any of these rare coins. Because TradeOgre do not accept any FIAT currencies, they naturally do not charge any wire fees. In general, this coin exchange service has a comfortable 0.20% flat fee on all fulfilled orders, which is within industry average. As I mentioned above, trading can commence immediately after you have signed up and deposited bitcoin or other currency of choice to your exchange wallet on TradeOgre.com. Their withdrawal times are lightning fast with funds sent to the blockchain in a matter of seconds. From the trading page you can make a buy or sell trade, take a look at the order book, get an instantaneous insight into recent market trades, or view your recent trade history. 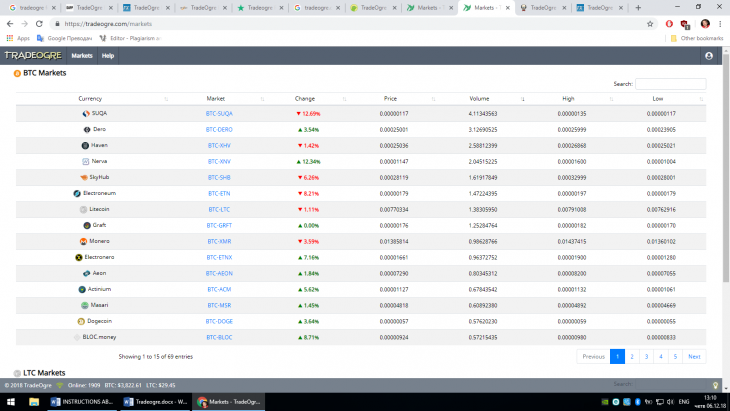 At the bottom of the trade page you can see a live BTC/USD ticker that helps you keep track of the current cryptocurrency market situation. The Market Depth function provides a helpful visual representation of the current buy & sell order books. Clicking on any of the listed markets (see the picture above) gives you a straightforward insight into the traded cryptocurrencies. The different columns of the trade table show the currency’s name, its ticker symbol, daily percentage change, price (in BTC), volume (in BTC). The 24-hour high and 24-hour low prices are shown on an FHD monitor. Each of these values can be sorted in ascending and descending order. To explore a specific market, simply click on the ‘Market’ ticker symbol. In the picture above, we clicked the “BTC-LOKI” link. 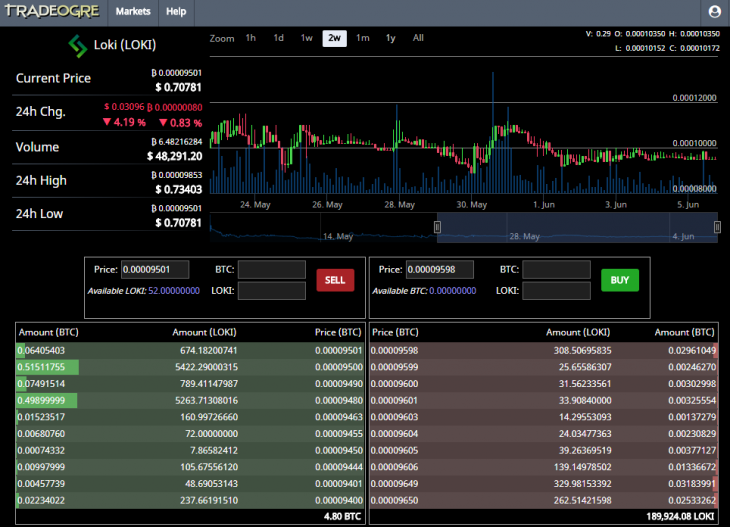 On the page you see above you can buy or sell LOKI for Bitcoin. By clicking the relevant filter above the chart graphics, the charts can be set to display hourly, daily, weekly, fortnightly, monthly or yearly price chart. We could confirm that this platform does not support Margin Trading, but there seems to be no conclusive information as to whether or not it supports Futures. On the whole, the design and functionality of their website is very good. The interface provides a lot of info and a wide variety of useful and effective functions. We’d recommend this platform to intermediate or advanced crypto traders and miners. In addition, TradeOgre API allows developers to integrate TradeOgre trading into their products. This being said, the web-based trading platform provided by TradeOgre is not suitable for people who are making their first steps in the field of cryptocurrency trading. It looks quite complicated, in spite of the fact that It provides a lot of information. Many users complain, for example that it simply isn’t intuitive. The charting is very basic and the few price spikes make it borderline useless. I would like to start this se section with the following WARNING: A fake support email address has been circulating, claiming to be the TradeOgre Support: tradeogresupport@protonmail.com. Do NOT contact this email address. If you happen to have any issues with depositing or withdrawing, the only cannel of communication with TradeOgre that you should use is the direct messaging service of Twitter. They usually respond quickly, and also are very polite and efficient. If you buy other cryptocurrencies for BTC on TradeOgre’s platform, make sure to send the coins to the correct deposit address. If you mess up the addresses, this is not the end of the world! Do not hesitate to reach out to them on Twitter and provide evidence that you’ve made a wrong transaction. After that your balance will usually be credited with the right amount of the right cryptocurrency in a few minutes. 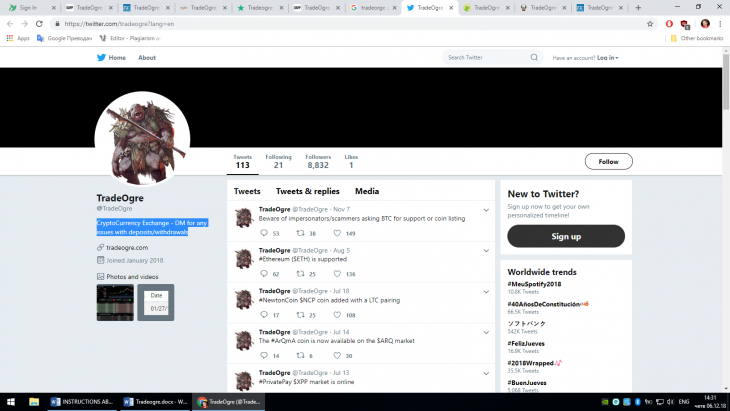 First and foremost, I’d like to make it a point that there have been quite a few posts on the web suggesting that the cryptocurrency trade charts featured by TadeOgre have been manipulated by bots. This means that the real-time fluctuations of the prices of the different cryptocurrencies against the Bitcoin are artificially caused. Beware!! Scam!! Tradeogre stole my cryptos 04.04.2018 08:30 AM. I had open sell order of 4500 GRAFT. They cancelled order and made new one with much lower price. After they sold my GRFT they withdraw BTC immediately to 1HpnSonQLxF8g4SVjKsCkiXPTxRdjRCuAu all take just 2minutes. I was at home that time on my computer and saw that almost all wallets were offline, including BTC and GRFT, so there is no change that this was hacker. 0-stars would be right for this stealing platform. I use this tiny exchange. This exchange is mostly for miners, and they list minerable, low volume coins. Layout of exchange is very easy to use, and exchange is very fast. I did not have any issue with this exchange, but it is a little bit scary to know that there is no possibility of any support, contact or ticket. The only contact is Twitter, but I found, that some coin development teams do not found the way how to contact them and arrange the coin listing. Positive side is that exchange owners recognize the community needs. Coin Graft (GRFT), do not give any info or date for exchange listing, even 3 weeks after the ICO was finish. Tradeogre recognize that and made “unsupported” listing of Graft. Now they have around 5 BTC daily volume of GRFT. 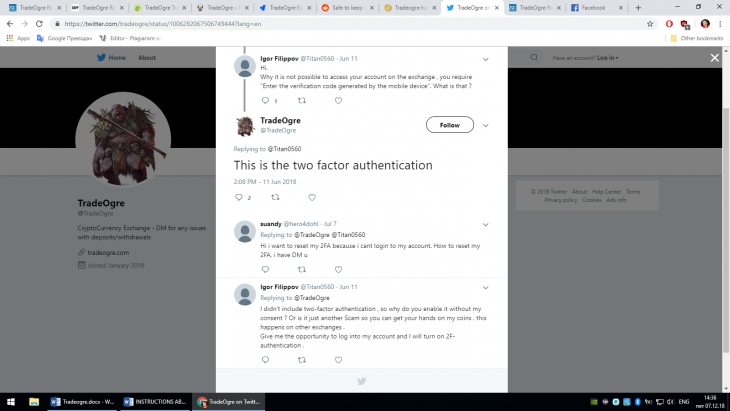 TradeOgre strongly recommends users to enable the two-factor authentication, otherwise known as 2FA, to enhance the security of their accounts. This option is available through Google Authenticator. It basically requires the user to provide a mobile number, at which they receive an authentication code each time they enter their password and click “log in”. As you can see in the picture below, some users have expressed confusion as to how exactly it works and why it is necessary at all. Despite the 2FA function, cryptowisser.com warns that the security score received by this cryptocurrency exchange site is F, when performing the test at Observatory by Mozilla (https://observatory.mozilla.org/). This is below industry average when it comes to top crypto exchanges. TradeOgre do store a lot of coins on their website. Practically, to start trading you’ve got to deposit bitcoin or other cryptocurrency to your exchange wallet. Speaking of wallets, in forum threads like this one, users have reported recurring problems with the platform’s wallets, so be prepared to act accordingly in case you encounter such issues. This fact probably explains why they are so secretive about the location of their company and the people behind the whole platform. They simply do not want to become the target of malevolent hackers. Speaking of hackers, some users share suspicions that the platform might have actually been targeted by hackers, albeit it has been around for less than twelve months. In this forum thread, for example, a certain user writes that they were unable to log in with their password, neither were they able to reset it. In the end, the user decided to open a new account with the same email address as their previous one, and it worked! On the whole, the majority of the online comments regarding the security level of this cryptocurrency trading platform suggest that TradeOgre is not a secure place to trade. They seem to agree that an exchange that finds it necessary to hide its registration information should never be trusted and express their indignation at the fact that the platform doesn’t even have a TOS or FAQ. And yet, it seems as though Tradeogre’s unbeatably low fees and charges have made many cryptocurrency traders quite tolerant to the above security issues. One certainly cannot say that the platform’s popularity is in decline! For now, we can only hope that as time goes by the TredeOgre team will step up their website’s security and will make a decisive move towards transparency. TradeOgre’s popularity is growing steadily, despite some security issues discussed above. They currently maintain very low trade volume, but it is likely to increase in the years to come. TradeOgre is a digital assets exchange, which supports a wide variety of interesting coins. Some of them can become a very risky investments, but at the same time this is one of the few venues where they are traded. Their main advantages include simple interface, great support, low transaction fees, very low withdrawal fees and easy trading process. The platform’s main shortcoming is that its team is unknown and it operates in an unregulated space.